EKF Diagnostics Holdings plc is a global, integrated medical diagnostics business. EKF designs and manufactures diagnostic equipment for use within Point-of-Care settings. The company's product portfolio includes small blood analysers and associated consumables used in testing patients for conditions including diabetes and anaemia. EKF is also a manufacturer of liquid reagents, enzymes and fermentation products used in the Central Laboratory market. EKF Diagnostics Holdings plc is head quartered in Cardiff, UK and has sites in five other countries. The Company is subject to the City Code on Takeover and Mergers, as published by the Takeover Panel and updated from time to time. 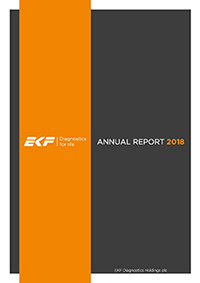 In the 25 years since EKF was founded it has grown from a humble electrical engineering company based in the hinterland of the east German city of Magdeburg into an international, stock market-listed medical technology business. At the turn of century EKF-diagnostic made the strategic decision to focus on developing a range of glucose, lactate and hemoglobin analyzers. In 2010 EKF-diagnostic was acquired by UK AIM-listed company IBL plc. This was followed by the acquisitions of Quotient Diagnostics Ltd in Walton-on-Thames and Dublin based Argutus Medical later the same year. In 2011 EKF Diagnostics Holdings plc bought Stanbio Laboratory, a clinical chemistry manufacturer based in Boerne, near San Antonio, Texas. The company’s US presence was increased further in 2014 through the purchase of Separation Technology Inc., Florida, a manufacturer of hematocrit analyzers and laboratory centrifuges. This was followed by the purchase of DiaSpect Medical A.B. a Swedish owned, German based manufacturer of hematology products. EKF Diagnostics has sold over 90,000 analyzers all around the world since 2008. This installed based forms the cornerstone of the EKF Point of Care business, requiring more than 60 million tests to be manufactured every year to service existing demand.